Is Apple About To Announce a New iPhone (6)? Gizmos for Geeks > News > Apple Readying To Announce New iPhone? On the back of the recent announcement, from Apple, regarding the flatter but more “depthy” version of iOS, Internet rumors abound that the company may be preparing to announce one or more new iPhone product(s). This kind of speculation does the rounds on an almost annual basis but this time the rumors are supported by the likes of Reuters and Stuff. Whether there will be an iPhone 5S before a full-blown 6 is not yet known but it does sound as if another new physical display size is likely to appear – with a possible 5.7” display reportedly in the works. Whatever the speculation we can be pretty sure a new iPhone will be announced at some point and our best guess (wish list!) of features is likely to include: a 12 megapixel camera, an A7 processor, NFC, and longer battery life. 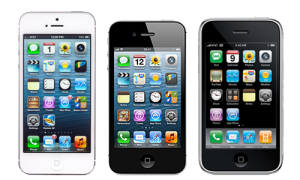 Apple iPhone sales “remain resilient” against other brands, according to a Tech Trader Daily report, including Windows Phone 8 which IB Times are reporting has seen sales growth, in British smartphone sales from February to April 2013, of “up 4.4% on the same period last year”. What features would you like to see in a new iPhone from Apple?